Smash Coins are special types of coins found in Super Smash Bros. Melee, Super Smash Bros. Brawl, and Super Smash Bros. for Nintendo 3DS / Wii U. In these games, there is a special kind of match called Coin Battle. Whenever a player takes damage, these Smash Coins spawn and fly out, to be collected by the players. Players do not lose coins when getting hit. Depending on how much damage and knockback the move deals, the coins can be bronze, silver, gold, or bills, often a mixture of them. The player loses these coins only when KO'd. 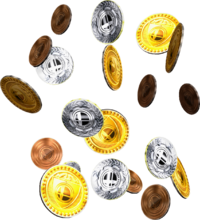 If KO'd on the side blast lines of the stage, the player releases these coins and allows opponents and teammates to take them. 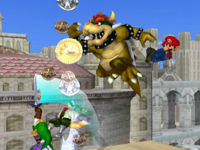 If the player is KO'd or KO'd on the top or bottom blast line, no coins can be snatched, although in Super Smash Bros. Melee, coins are seen if the player is Star KO'd or hits the screen. In Super Smash Bros. Melee, gold Smash Coins are worth ten, silver are worth five, and bronze are worth one. Whenever a player gets KO'ed, he or she loses half of coins (rounded down). The player or team with the most Smash Coins when time runs out wins. If a tie occurs, then it will go to Sudden Death. Smash Coins reappear in Super Smash Bros. Brawl in the Coin Battle. However, there are also Smash Bills appearing. The values of the Smash Coins are different in this game. Gold coins are worth six Smash Coins, silver coins are worth three, and bronze coins are worth one. The Smash Bills are worth ten Smash Coins each. If KO'd, players lose half their coins but the max coins lost is 100 unlike in Super Smash Bros. Melee. Coin Battle returns only in Super Smash Bros. for Wii U, with the coins and bills serving the same purpose as they did in previous games. In the PAL version of Super Smash Bros. for Nintendo 3DS, however, the trophy description for the gold earned in various modes of the game refers to them as "Smash Coins", despite both serving different functions. GCN Super Smash Bros. Melee Items that appear each time you smack an opponent in a Coin Battle. The person who has the most coins when the game ends is the winner. There are gold, silver, and bronze coins, which are worth six, three, and one point respectively. Attacks that cause the most damage also produce the most valuable coins. You don't lose coins when you take damage. Wii U Super Smash Bros. for Wii U Coin battles see which player can collect the most coins. Beating up your opponents will send coins flying, and then you must collect them! There are three types of coins: Gold (6 points), Silver (3 points), and Bronze (1 point). Deal more damage to your opponent to make the more valuable coins fly free. This page was last edited on December 15, 2018, at 09:20.